Scarves are generally an accessory of colder months. But, when made with a lighter fabric they can be worn throughout the year. A simple circle scarf is an easy accessory to add to any outfit, and can be tossed in a bag to bring a long “just in case” – this is especially helpful in chilly restaurants and movie theaters. I’ve seen a lot of circle scarves around, but I can never find one that’s in a fun enough, and light enough fabric. So, I made my own. Here’s a simple how to on making your own circle scarf, too. Fold that fabric in half to get a good idea of the parts of your pattern that will show in your final product. Now unfold that fabric and refold it in half with the print facing inward. 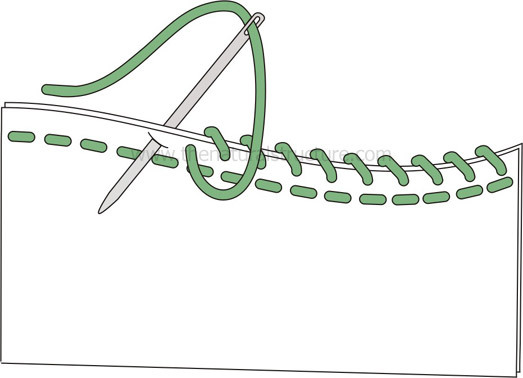 Pin the sides together so that you sew straight. Sew on up the sides. Next is the trickiest part – reach one arm all the way through the tube at the seam, and grab a hold of the end. Pull the end under and back through the tube so that it comes to meet the other end at the top. You are essentially pulling the tube inside itself, which will decrease the length of your piece by half. Once you have matched up those two sides, sew them up. Make sure to leave around three inches open on the end. Sew the tube, and leave those three inches open. Now, pull the scarf inside out through the three inch opening, so that the print shows. Be patient, this takes a little finesse to get so much fabric though such a small opening. Pull scarf right side out through your opening. Finally, you’re ready to sew the hole closed. This can be done by hand via whip stitch , or you can use your sewing machine to just sew it right up. Either work, but the whip stitch looks cleaner. I was pressed for time, and my thread matched exactly, so I just used my machine. You’re done! Now you’ve got a genuine circle scarf that can be worn as one long loop, or doubled up. If you try out this tutorial with your favorite Marimekko fabric, AlwaysMod would love to see your results. Just send us a picture and we’ll post it on the blog! Like the print I used? Find more like it here! 2 Comments on "Make your own Marimekko Circle Scarf"
the measurements of 57″ x 45″ made my scarf turn out very large. not like you have in the photo. I truly believe the measurements are incorrect. can you please provide the correct measurements? thank you.